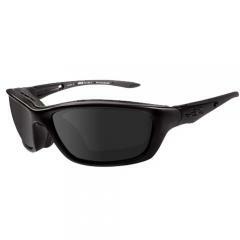 Designed for use by Special Forces operatives, the BRICK Black Ops Tactical Sunglasses from Wiley X deliver the strength, durability and protection needed to handle the most extreme environments possible. Shatterproof lenses guard the eyes against airborne projectiles and exceed ANSI Z87 high-velocity safety standards. Virtually indestructible TRILOID® nylon frames and a removable facial cavity seal offer added protection, while neoprene temple socks keep the glasses comfortably secured. The lenses feature a brick grey tint for undistorted visibility and block 100% of UVA and UVB rays, making the glasses perfect for everything from range shooting to high-speed motorcycle chases through the desert. Great glasses, fits perfectly I really like the dark lenses. Three stars only because they are not polarized. They are just tinted safety glasses. They are also not very scratch resistant my son scratched them within a week of getting them on our wooden floor.